Water Pointe I, unit 903 is a beautiful gem in the heart of Windy Hill in North Myrtle Beach. This resort's amenities include WiFi, indoor and outdoor pools, hot tub, kiddie pool, and beach access. Enjoy the Ocean Drive Difference by starting your vacation immediately upon arrival, as this property comes with fresh bed linens/bath towels, the beds are already made up for you, and the departure maid service are all included in your price. The interior of this 3 bedroom condo is tastefully decorated and features an attractive stone fireplace, a wet bar, fully equipped kitchen, modern furniture, and wall-mounted flat screen TV. The large master bedroom has a private bath and striking ocean views. 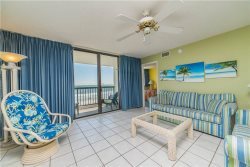 The beach is also visible from the living room and the oceanfront balcony as well. Three bedrooms provide enough room for up to 8 people. Rent Water Pointe 903 for your family vacation, winter monthly stay, or off-season mini vacation and enjoy top quality beachfront accommodations at an affordable rate! Water Pointe I is located in Windy Hill and is close to Barefoot Landing, live entertainment, shopping, dining, and golf courses. Myrtle Beach attractions are just minutes away and the beach lies at the foot of the building! Call 877-287-2977 to rent this condo and start planning your vacation today.